'Pacific Star' (IMO 6620773) at San Diego, California, USA - 1991 or 92 [photo © Mr. DOT]. 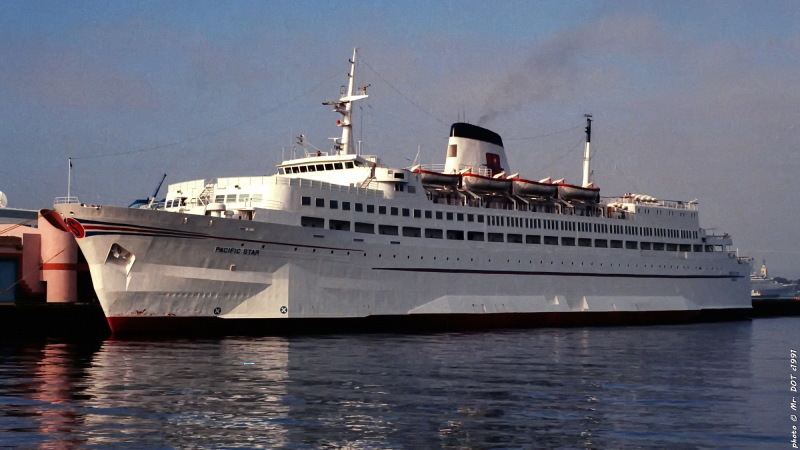 A year or two prior to this photo, this ship was in service between Seattle, Washington, USA, & Victoria, BC, Canada, as the 'Crown Princess Victoria'. She was built for the Sweden - UK -run in the "small family cars only era". Later is was necessary to increase the car capacity by adding an extra car deck: that is why the bow is so strange. They simply cut the hull horizontal and added two meters. I had once the pleasure to sail in her from Grena to Varberg, inside a very pleasant vessel with wood panelling etc. A real oldie! Oh no ! If she needs all that extra stuff around her to keep her upright, then perhaps she should gracefully retire. It all looks like the maritime equivalent of a zimmer frame. This ships remembers me other ship usually carrying pilgrims from Egypt to Saudi Arabia, they increased breath in order to gain stability because they constructed several new decks on top for increase passenger number. The ship got fire and capsized with great loss of lives due to lack of comunications with rescue services. She was much more beautiful without the sponsons and before the superstructure in the bow! thanks, my brother is my help with finding and scanning all my many negs, as for this one, she was a short term vessel on our pacific northwest scene, but when stena couldn't milk this marine market, they buggered off to mexico, and took this 'vessel' with them! mrdot. As for this ship... as if one more sponson wasn't enough! This photo has been shown 1,423 times since it was added to the site.